No two wines from Sonoma County are the same. I believe that statement to ring expressly true and so should you. Jean-Claude Boisset saw the potential in Sonoma and created Boisset Family Estates with singular viniculturaliste swagger. Boisset Family Estates is led by Jean-Charles Boisset, who is also President of Boisset, La Famille des Grands Vins. Eight wineries make up the California collection, including DeLoach Vineyards. It was there that we tasted eight conspicuous examples of Pinot Noir and Chardonnay. Mapping a cru systematic out of Sonoma County is a massive and seemingly boundless undertaking. This wine country section of Northern California is one of the most complex regions in the world, with valleys, plains, ridges, slopes and mountains of every aspect. There are more single-vineyard wines pulled from vines dotting micro-climatic, highly specific sites than anywhere in the world. Or so it seems. Unlike Burgundy, so many vintners farm and/or produce the only wine made from that specific parcel. The permutations of cru definition are multiplied 100-fold. The diagram is drawn with near-infinite numbers of circles and lines. The multeity of style and the illimitable viticultural approach illustrates how Sonoma’s 16 AVA’s (American Viticultural Areas) are a study in variegation and variance. The multifarious geographical scope of coast, penetrating valleys and mountain ranch land conspire to design the impossibility of squeezing out clarity from a region in direct contrast to concepts that choose to exhort compounding synchronisms. When I returned from California in February I wrote “the most pertinent question now in my mind is this. Can European wine keep up with the fictionality of North American reality?” Unearthing discoveries from idiosyncrasy to heterogeneity is what people want and it’s not just rambling wine journalists or thrill-seeking sommeliers who are looking for wine-contrariety nirvana. Craft is in. Small batch, low-production, around the corner from nowhere, never heard of that is what sells. And Sonoma has got more than enough answers to last for centuries. 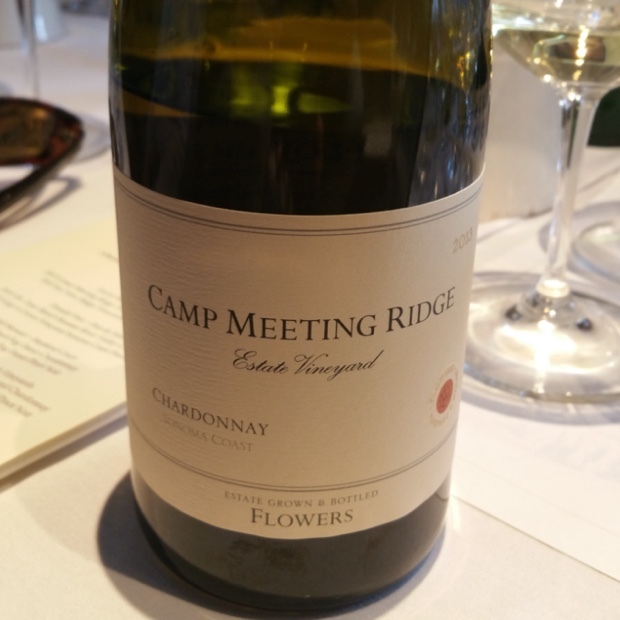 Which brings us to the discussion centring on Pinot Noir and Chardonnay, the varietal darlings of Sonoma County, especially when the vineyards that grow them are tied directly to the fog’s greatest chaperone, the Petaluma Wine Gap. The different strokes inherent to the Burgundian expatriates raised on the coast, on inbound slopes and on craggy ridges is mind-numbing. The thread that ties them together is related to the fog but it is not enough to formalize, generalize or philosophize a unifying theme. Bring the wines of DeLoach, Patz & Hall, Flowers and Hartford together in one room and you might expect some repetition. I found none, save for one mien of chiaroscuro connection. Creep out from that shadow and find a world of deference and difference, from Pinot to Pinot and from Chardonnay to Chardonnay. 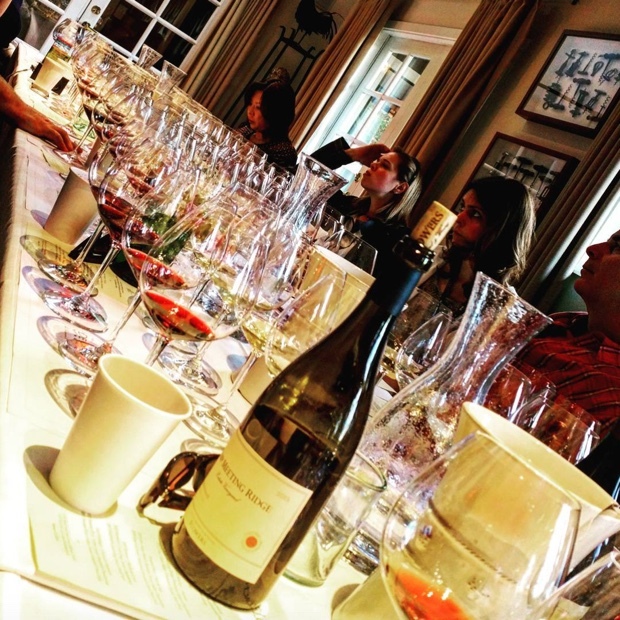 In conjunction with California Wines Canada, The California Wine Institute, Sonoma Vintners and Boisset Family Estates, a group of Canadian journalists and sommeliers were invited to DeLoach Vineyards to taste four Pinot Noir and four Chardonnay. Here are my notes. Count me in when this troupe convenes. The comedy is relentless, la comida outstanding. Wine brings us together and we take care of the rest. Thanks to the E-man for a flawlessly executed feast.